A motorist has been reported for driving without due care after a four vehicle collision brought Fletton Parkway to a standstill last night, Thursday. 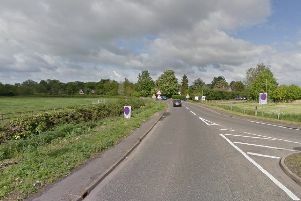 Police were called at 5.30pm to a four vehicle collision on the A1139 at Orton Malborne. The crash involved a red Mazda Takara, a white Mercedes Sprinter van, a grey Honda CRV and a silver Renault Clio. Fire and ambulance crews were also called. One person suffered slight injuries and was taken to hospital. One driver was also reported for driving without due care. Queuing traffic stretched from the Hampton roundabout junction back to the A1M and Peterborough Services. The road was clear at about 8.30pm.